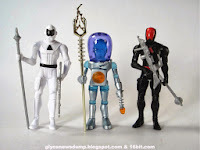 My Power-Con exclusive Power Lords Power Soldier and Elite Power Soldier showed up in the FedEx today just after lunch, meaning I finally got to find out just why nobody was posting pictures of Onell Design or Outer Space Men figure parts swapped in with these new sci-fi marvels. 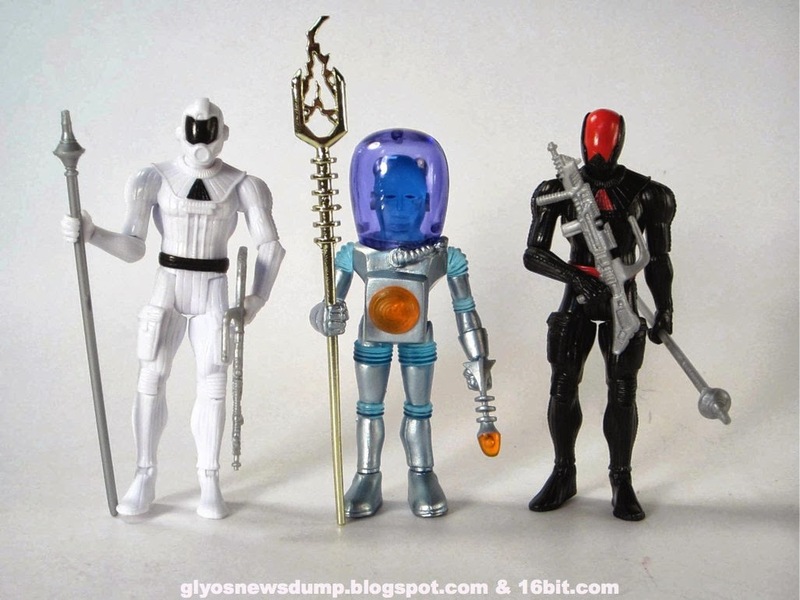 The good news is that the Power Lords from the Four Horsemen use the Glyos system, but with a twist. 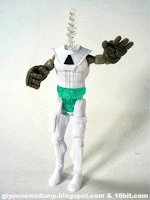 Many of the parts - like the shoulders and head - use the traditional full-size Glyos plug. The elbows, wrists, and ankles use a smaller Glyos plug as seen in The Outer Space Men hands and feet for Alpha 7 and Gemini. Due to some peg gender-bending, you can't put the OSM hands on the Power Lords wrists - plugs plus plugs and holes plus holes won't work here. The same is true of the feet - you may only swap those between Power Soldiers. 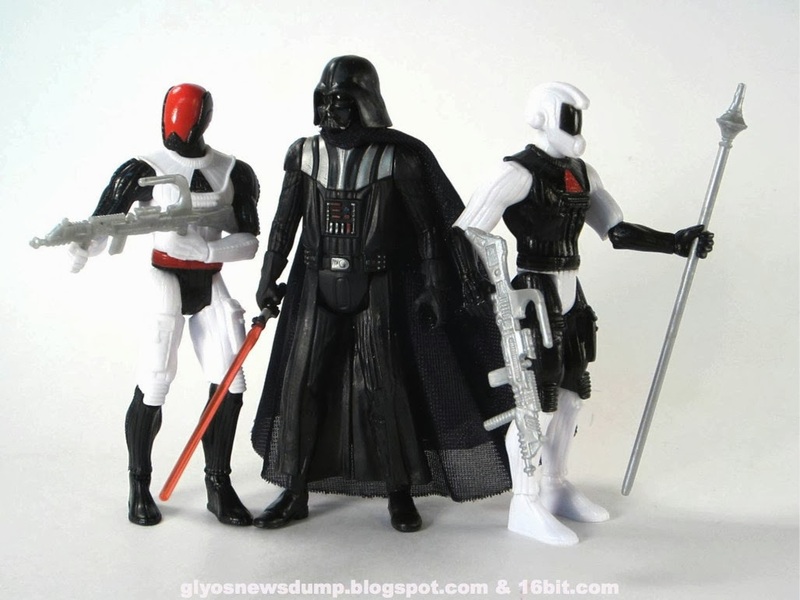 The figures are 3 3/4-inch scale, more or less, putting them right at home with your Outer Space Men and Star Wars action figures. On a shelf, these are probably more likely to go with non-Glyos figures due to the realism of sculpts and the fact that while some of the parts swap nicely, others don't. Getting the existing Glyos parts into a Power Soldier torso is tricky - the hole is recessed deeply in the shoulders, and the Power Soldier ball shoulders look positively wonky on an Outer Space Men torso. The legs can sort of be swapped onto the Onell hips, but they don't really work on the OSM. 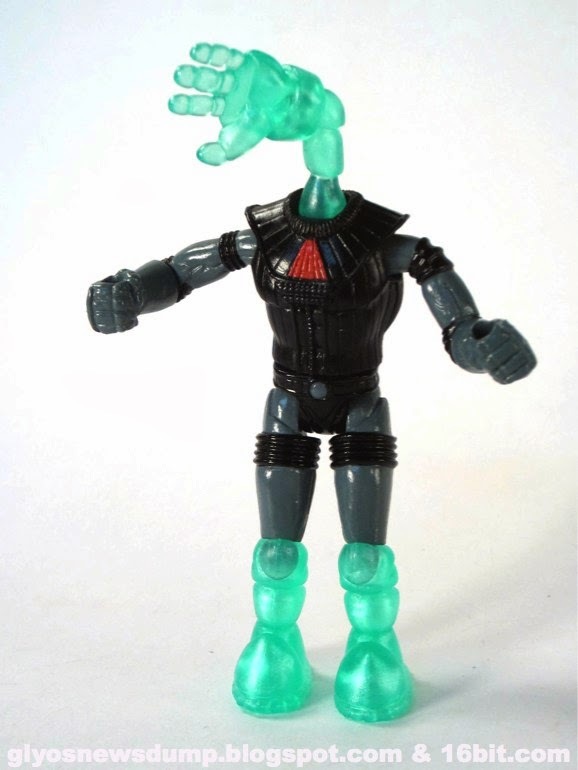 Heads from other figures don't fit easily in the Power Lords socket other than the Banimon offerings, but you can get some long, narrow pieces to fit in there as you see an arm and a ray gun in the above pictures. I've only had these for a short while, and a longer review with impressions will be posted to 16bit.com on Wednesday. In the meantime, enjoy the pictures and let me know what you're coming up with! New releases from Ni Stuff in the 481 Universe go live tomorrow at 9:000 PM Eastern! Be ready with your Paypal account and your clicking finger, because last time the store got bogged down with heavy traffic and most items were gone (or on their way) before some people could even see what was up for sale. New items include a really cheap $6 sack of clear Hemic Anomaly figures, of which I own in silver and glow-in-the-dark, and basically dig. 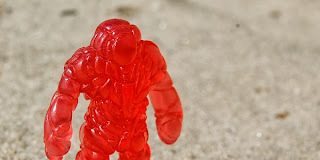 A new clear red Dr. Styre head will be $2 and there will be various figures as you see on the right here. 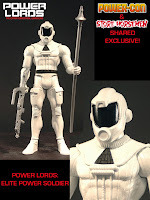 Over at the 481 Universe are several new figure previews for this Friday's release. 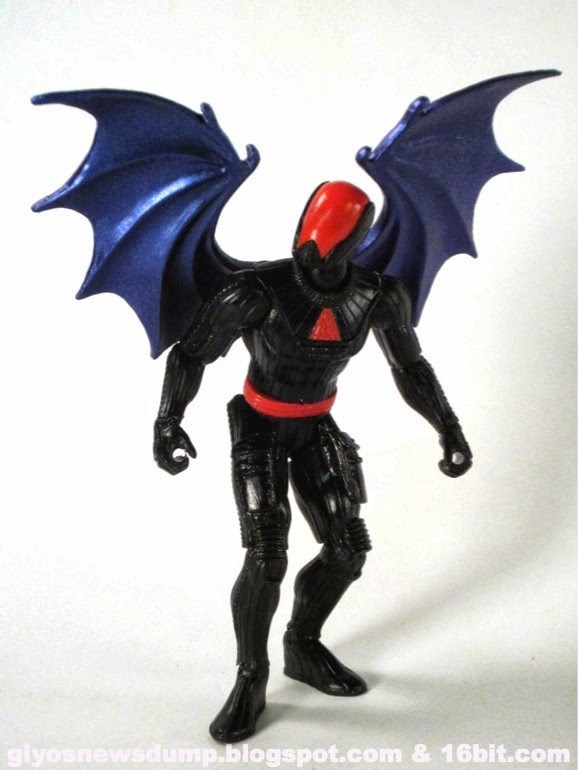 On Friday, September 27 at 9:00 PM Eastern, multiple new black and clear red figures will become available. Here's one, and here's another. The full menu has yet to be posted, but if history is any indication you will likely find items will be sold out nearly immediately and before you can even get a look at the store. 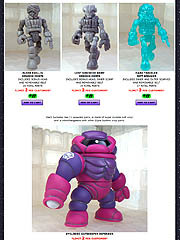 There are also figures based on these designs being sold at NYCC, stay tuned to his and this site for more on that. In a post about Paint Masks - which is super cool given I've never seen a good look at this stage of the manufacturing process before - Onell Design gives us a sneak peek at a future Armovor head! It took me a while to track down the Crayboth Pack 5 Red and Green Aura (and it cost me) but it was worth it! 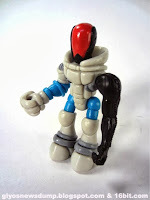 For those of you not in the know, the Onell Design Glyos toys tend to be produced in limited numbers and most designs are eventually permanently retired. The glow-in-the-dark red "Solaris" plastic was used back around 2008 but for reasons not fully explored, it is no longer in production. (I've heard rumors of changes in toy safety regulations and increasing materials costs may have had something to do with it but haven't seen anything remotely official with either.) The "Green Aura" figure has seen additional production runs, as recently as 2012, but the red one has been sold out since before I started pursuing them in 2010. 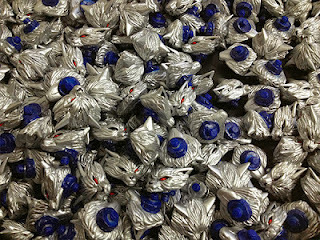 If you ordered some Glyos a couple of weeks back, your boxes likely arrived today or are just about to show up. Onell Design frequently add bonuses to orders and this time you get these bluegreen pearly Dark Traveler Bonus Parts. The heads are Elder Exellis and Lost Sincroid Army noggins in this amazing green color, which changes wildly depending on how it's lit. The eyes are painted white. The belt, on the other hand, is a bit of a mystery - it's covered in pouches and has a triangle pattern on the back, and it looks a heck of a lot like Pheyden's. If I didn't know better, I'd say it's a sneak peak for a new Pheyden or Pheyden-like being - the Dark Traveler figure sold in this drop has a very Pheyden-like head and face on it, plus two scarves. It doesn't match the belts of the other figures in the release, so take it as you will - it's a nifty part, the significance of which has yet to be fully divulged. Speculate away below! 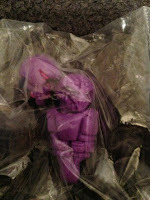 UPDATE: Our pal Stan on Twitter let me know that there's also a Purple Traveler Body with Phanost and Scar Pheyden heads in some orders - thank you for the info, Stan! The new heads are 2-3 pieces each. Each of the 3 new heads have removable domes now. 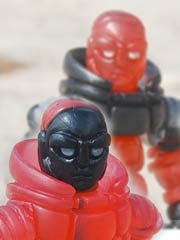 Small, mini scarves were included with the new Lost Sincroid Army grey figure heads as well as around the unique Dark Traveler Rift Breaker new head. I'm still opening and photographing these, so more as I have it in Figure of the Day and here! Store Horsemen and Power-Con have two exclusive Power Lords figures this weekend! At $10 each, each Power Soldier is something of a bargain. There was no confirmation as to online availability yet but there's a black figure with red markings - Power Soldier - and a white figure with black markings - Elite Power Soldier. If anyone is going and buys extras, do let me know as I'd love to buy a set myself. Behold, the MVR Standard Noboto! 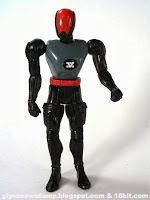 Like his series mate Gobon, it's the first "standard" Noboto and due to the three colors of plastic used, he was joined by two brothers made from the leftover pieces. The standard Noboto has a yellow head with white eyes (the only Noboto with more or less normal whites of his eyes), brown hands and feet, and a brown belt over a green body. It's certainly an unexpected color combination, but it works. It's up! It seems like most (if not all) items from the Enigma Source release from Onell Design are live now and you can click here to see what's left. I would expect the pink Morderius Gobon will go soon, as will the swell Syclodoc - I spent more than is reasonable, as this was a pretty fantastic batch. I'm a little surprised the new guys didn't blow out, but that's good news for you as you can actually get these great new figures. And the Armorvor. Don't miss the Armorvor. Along with some so-vivid-I-can't-believe-it's-real imagery, Onell Design posted the list of Enigma Source mission details. 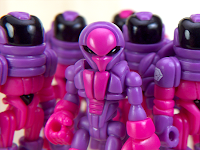 The drop has a lot of pink, a lot of purple, and some mystery figures. It's also worth noting that the Ivorinium Noboto will be back (as promised) along with matching Hub sets, Crayboths, and Glyans. 3 additional Noboto flavors will be available, as will a pink and purple Armorvor, a new Syclodoc for the first time in months, and yet another stunning Sarvos figure. 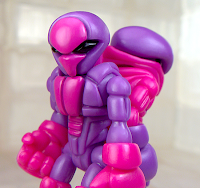 Unless it's a red herring, it looks like the Gatekeeper Evolution drop on Sunday may have new figures - it's tagged with Lost Sincroid Army, so a new figure is very possible in this new purple and pink mix. Click here for some details - a few characters appear to be on deck, so this should be a robust and very pink release. I've heard rumors of a few other items - possibly including a wearable one - in this drop, so you might want to skip lunch for a few days to have a few bucks for Sunday's 9:30 Eastern release! 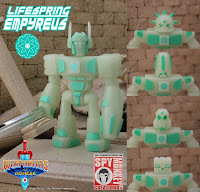 The flesh-colored SDCC exclusive WOMOMFG figures are long gone, but Glow in the Dark Lifespring Empyreus and Gohlem figures - plus weapons - are in stock now at the Spy Monkey Creations store. I picked up the flesh and glow Gohlems at Comic-Con and am quite pleased with both - so go ahead and click here to buy 'em if you're on the fence. 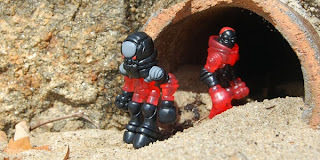 They're Glyos-compatible and they glow, what more do you want? The wonderful people behind DoomKick.com brought us this great post showing what's coming up this week from the Weaponeers of Monkaa! 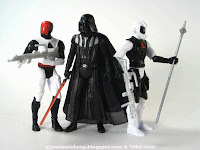 Two glow-in-the-dark figures, both SDCC items, and some armory sets with vac-metal silver bits are up for grabs. You're going to want to snag a few of these - I got the WOMOMFG Gohlem and Glowstone Gohlem at Comic-Con, and they're really nice! Click here to see the pictures and menu.